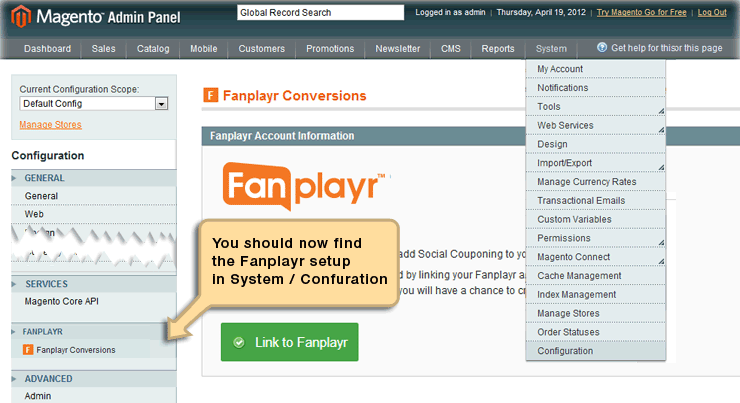 To link your Magento Store to a Fanplayr account you will need to install the Magento Extension. Here&apos;s a quick rundown that should help you with this installation. If you have any questions please don&apos;t hesitate to contact us. Firstly let&apos;s either create a link to your store in your Fanplayr account, and then get the link details. Access your Fanplayr account at http://portal.fanplayr.com. From the menu at the top choose Account and then Linked Store from the menu at the left. If your store is not already linked you should be able to enter your Shop URL, and choose the type of store. Here, choose "Magento" as your store type, and for Shop URL, enter the address of your store including the "http://". You should now see an Account Key and Secret which you will use later to link your accounts. You will then need to manually install the module by copying it to your Magento installation. Note: Sometimes you may get a "404 Error" when clicking on this menu item. Don&apos;t worry - it happens sometimes. If this does happen, simply log out, and then in again, from your Magento Admin. If this does not fix the problem please see our article on fixing the 404 error. You should now see entry for "Account Key" and "Secret". Enter these details from the previous step and click the save button at the bottom of the screen. You should now be linked. If you have any questions please contact us.